Moss Bluff Elementary School in Lake Charles, La., wanted to speed up the cafeteria line and reduce errors in lunch accounting. So the school bought a Fujitsu PalmSecure biometric ID system, which has a scanner that reads the unique patterns of blood vessels in a human palm, enabling a positive ID, much like a fingerprint would. When school officials sent out a letter announcing the program, some parents freaked out. The parents had concerns centering around the belief that all forms of biometric ID constitute what the Christian Bible calls "the mark of the beast." Here's what it says in Revelation 13:15-18: "And he causeth all, both small and great, rich and poor, free and bond, to receive a mark in their right hand, or in their foreheads: And that no man might buy or sell, save he that had the mark, OR the name of the beast, or the number of his name ... and his number is six hundred threescore and six." I was surprised to learn while researching this column that opposition to any sort of biometric ID systems for payment might be widespread among some Christian groups. A Christian blogger named Elwood Sanders summed up the biblical case for rejection of biometric ID like this: "Let me state my position clear: NO BIOMETRIC ID CARD! PERIOD! Every evangelical Christian needs to say NO to this kind of thing." 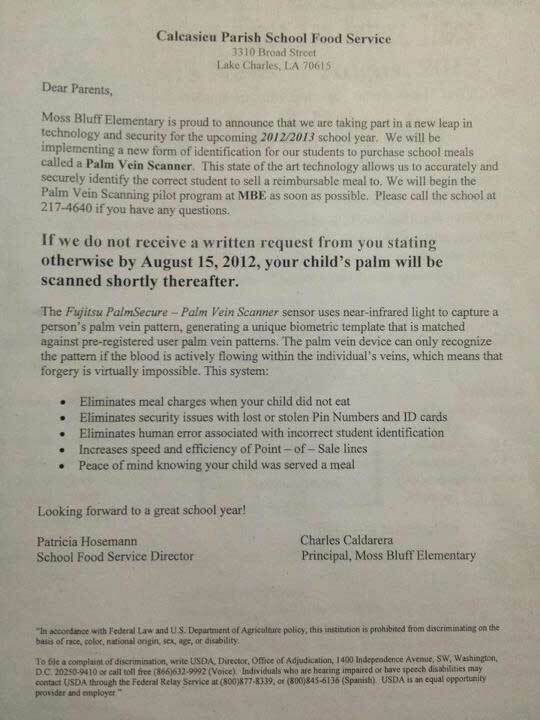 The case of Moss Bluff Elementary highlights our current reality with biometric ID technology: It's becoming so mainstream that schools are using it in their cafeterias. But some people are rejecting it based on religious grounds. So will pervasive biometric ID be adopted? Or rejected? The answer is less clear than you might think. Opposition to biometric ID is pretty widespread, and most of that opposition is based not on prophecy, but on concerns about privacy. A Senate hearing last month revealed the U.S. government's own concerns about the use of facial-recognition technology, both by government law enforcement agencies and private companies like Facebook. Europe is broadly resisting Facebook's facial recognition initiative, especially Germany. A professor from Spain's Universidad Autonoma de Madrid told the Black Hat conference recently that researchers there have come up with a way to hack iris recognition systems that fools the systems into identifying one person as another, raising fears that the main benefit of biometrics -- certainty -- may not be as reliable as promised. There are many privacy organizations and advocates with serious reservations about the use of biometric identification technology of any kind.